For the second year in a row, UF MBA was named the No. 1 program in the world for Value for Money, which is determined based on alumni salary, course length, tuition, other costs and lost income during the MBA. Any financial help given to alumni is subtracted from the total. 90 percent of the full-time MBA alumni surveyed indicated their aims were achieved during their time in the program, meaning the extent to which alumni fulfilled their stated goals or reasons for pursuing an MBA. UF MBA has seen meteoric growth on the Financial Times’ list of the top global MBA programs since it was ranked in 2018, having been previously unranked since 2011. Since it was last ranked in 2018, UF MBA climbed 19 spots among global MBA programs, 10 spots among U.S. schools and seven spots among U.S. publics. The Financial Times’ rankings are calculated based on 20 different criteria, including career progress, career services and alumni recommendation, as well as value for money, salary increase and aims achieved. UF MBA has seen significant gains across rankings of its Full-Time program, including a No. 5 rank among U.S. publics and a listing as one of America’s best graduate schools. 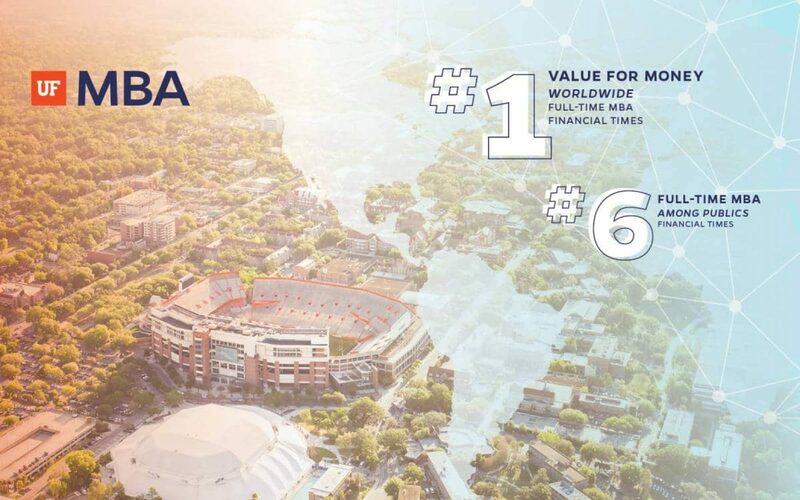 In addition to its strong rankings, the UF MBA program is also offering 100% tuition scholarships to enable its Full-Time students to pursue an MBA without breaking the bank. Scholarships are awarded to cover tuition and fees for in-state and out-of-state qualified students admitted to the full-time program. For more information about the 100% tuition scholarship, please click here. Want to learn more about the value of an MBA from the University of Florida? Request information about the UF MBA Full-Time program today.